Once again, I am doing a watercolor painting using a special type of mineral paper. This is a "tree-friendly" paper, which means that no trees were destroyed in order to make it. It is made using stones (Calcium Carbonate) ground very fine and mixed with a small amount of plastic binder. I just love the way the paint responds to this paper. The paint doesn't absorb into the paper as it does with regular watercolor paper. But rather, this paper allows the paint to float on the surface and enables the paint to mingle and move, creating beautiful color blends and surprising effects. A pair of worn and weathered tree stumps that have become one solid unit with the rocks and earth that the roots are entangled with. This is an original watercolor painting on tree-friendly mineral paper. This is an original watercolor painting, inspired by the Hoh Rain Forest in the Olympic National Park. It is painted using the finest watercolor pigments on tree-friendly mineral paper. On the back cover of Watercolor Artist magazine. 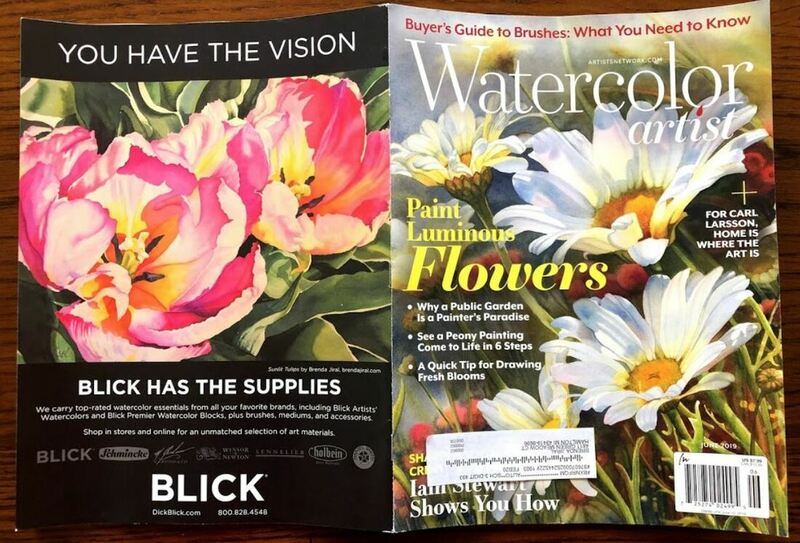 Blick Art Materials chose my painting: "Sunlit Tulips" for their June 2019 back cover advertisement. There is nothing quite like seeing your work published in a fine magazine!